Comparing John Lannan to Tom Gorzelanny; did Amaro make the right decision? The Brewers and left-hander Tom Gorzelanny agreed to terms on a two-year contract last week. The 30-year-old will earn close to $6 million while providing potential depth at the back-end of Milwaukee's starting rotation. Do the circumstances sound familiar? The Phillies made a similar move last week, signing left-hander John Lannan to a one-year deal worth $2.5 million. Like Gorzelanny, he will compete for a back-end spot in the Phillies' starting rotation. Gorzelanny and Lannan are similar pitchers; neither are overpowering and both rely on the command of their off-speed pitches to succeed. Gorzelanny put up better numbers last season but he pitched exclusively out of the bullpen for the first time in his major league career. Lannan, meanwhile, spent the majority of last season at Triple-A Syracuse as the Nationals reworked their starting rotation. Being that Gorzelanny and Lannan both were on the free-agent market and the Phillies needed a starting pitcher, did Ruben Amaro Jr. make a smart decision? Looking specifically at career totals, yes. 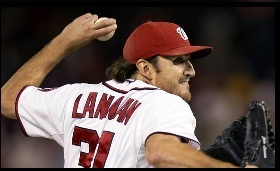 Neither pitcher has a great WHIP but Lannan has a slim advantage (1.42 vs. 1.45). Lannan also has a better career ERA (4.01 vs. 4.41) and does a better job at keeping the ball on the ground (1.92 GB/FB ratio vs. 1.02) which is crucial in a place like Citizens Bank Park. Gorzelanny's lone advantage is in K/BB ratio (1.77 vs. 1.39). Delving deeper, Lannan has a significant advantage over Gorzelanny in Adjusted Pitching Runs - an advanced pitching metric used to measure the number of runs a pitcher prevents from scoring compared to the league's average pitcher in a neutral park in the same amount of innings. It is similar to ERA+. He also has a better WAR per 162 games and a better strand rate (72.5% vs. 72.4%). Given the contractual details, it appears Amaro made the right decision in signing Lannan over Gorzelanny.